Yikes. Well, happy New Year just the same. 2010 is nine whole years after the farthest forward you can travel in Time Pilot, so my inner teenage arcade rat is having a very hard time accepting that we're living in such a futuristic day and age. But here we are a full twenty-two years after Manhattan was turned into a giant prison and just twelve short years away from joining the food supply as delicious green wafers. Strange days indeed! So congratulations to both of us for making it this far. Time to disengage the cryonic sleep setting on my blog as I've been busy during this time and have a few things I'd like to talk about. Let's see if I can be quasi-consistent with the online output this time around. How's this year treating you so far? Ann Druyan and Nick Sagan give us a unique and heartfelt look into the origins of Cosmos and Contact — and what esteemed scientist, citizen, father, and husband Carl Sagan was really like. Heartfelt is right as I found myself moved by this interview and I thought Annie said some particularly beautiful things. 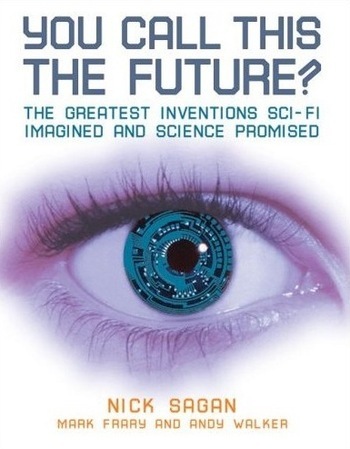 New Scientist magazine recently asked authors to weigh in on the future of science fiction. Margaret Atwood, Stephen Baxter, William Gibson, Ursula K. Le Guin, Kim Stanley Robinson and I all got the call. It's an honor and a thrill, and also a profoundly humbling experience, to have been invited to take part in this, with my opinions included among those of five hugely influential SF luminaries. Award-winning writer Marcus Chown kicks off the discussion with the provocative and provocatively-titled article, Is Science Fiction Dying? Highly recommended--you can read it here. You Call This The Future? You Call This The Future? The Greatest Inventions Sci-Fi Imagined And Science Promised will be hitting bookshelves this April. It's a collaboration with Mark Frary and Andy Walker, two wonderful science & technology writers. I'm holding an advance copy in my hand and I'm very happy with what a fun and informative read it is. You Call This The Future? is an exploration of technologies that have tantalized us in science fiction for many years but have yet to materialize in the world of today. We go in search of flying cars, warp drives, artificial intelligence, time travel, terraforming and many more, with a total of 50 inventions in all. How are we doing on those cybernetic exoskeletons? What's the hold up on force fields? Hope you pick up a copy and enjoy it as much as I've enjoyed working on it. We hope to create a sense of wonder, excitement, inspiration, and fun with these visions of a possible tomorrow. It is our mission to help engender a positive attitude toward the future in young and old alike. Please feel free to explore the site and let your mind soar into a better tomorrow. The site's filled with futurism, technology, artwork of what tomorrow might look like, and a video about nano-replication. Weeks ago, Brian kindly invited me to contribute to the Futurist Forum, which asks intriguing questions like, "If visitors from the year 2057 traveled back through time to the present, what message do you think they would give to us?" and "What do you think is the biggest threat to prolonged human survival?" Among those asked: Sustainability Consultant Daniel Bowers, Musician Mike Garson, and Industrial Designer Jacque Fresco. Well worth checking out. My short story, "Tees and Sympathy," is now available online in PDF format along with the rest of Subterranean Magazine #4. It's absolutely free, and you can download it here. 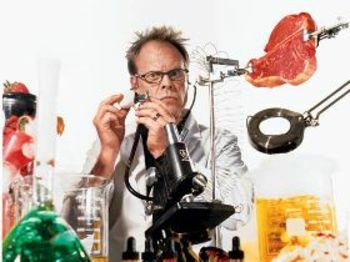 Are you familiar with Alton Brown? He's a celebrity chef and author, sometimes known as the Mr. Wizard of culinary pursuits for his ability to bring both science and humor to the kitchen. He's the host of Good Eats, a wonderful show on the Food Network. It's the kind of show you can enjoy even if you're not particularly interested in cooking. 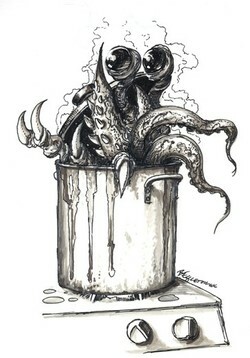 Nutritious and delicious, as a certain character of mine would say. Enjoy! So I'll be attending LACon IV this week, boarding my flight west in (yikes) just a few hours. Not 100% sure I should be flying on Doomsday, but hey, what are you going to do? While I highly doubt my flight will run into any trouble, I suppose anything's possible so don't let me leave without thanking you all for your friendship and/or patronage. Deeply appreciated. And thanks for all the comments and email wishing my mother well. Very nice of you, and I've passed those sentiments on to her. John Varley said "We all love after-the-bomb stories. If we didn't, why would there be so many of them?" Why do we all love them? During the Cold War, the threat of nuclear annihilation was very real; today, the world is a different place, but the threat of annihilation is once again very real. Has the sub-genre changed? How are 21st Century post-apocalyptic stories different from those written during the Cold War era? IS ART THE INSPIRATION FOR MADNESS? Writers are like gods. Whatever they want their characters to do, they do. If they want lightning to strike, the sky is shattered by electricity. Are they responsible for the themes, the ideas, and the actions in their works? Is there a responsibility not to show how to make a bomb? Should good always triumph over evil? What makes for an addictive computer game? What is there about Doom or Halo that made you waste countless hours playing? Game designers discuss what they do. Genetic modification from food to people; how far is too far? Batman has become the "Dark Knight". The X-Files is filled with conspiracies and people wearing dark clothes walking around in dark rooms. Before that, the great New Wave of SF, which called itself literary, was deeply pessimistic. Is this mature, childish, or the swing of a pendulum? My internet access might be a bit spotty on the trip, so there's a chance you won't hear much from me here for a few days. If so, I'll come back afterwards with a full report. Bye now! Actually, this handsome creature with the soulful eyes is the illustration that accompanies "Tees and Sympathy." What's "Tees and Sympathy?" Why, it's my first published short story. According to the editor, it's "super-fabulous, and very funny." It'll be published in Subterranean Magazine Issue #4, which you can preorder by clicking here. Plus you get illustrations by Bob Eggleton, book reviews, and the sense of satisfaction that comes with responsible magazine ownership. I couldn't stay for it all, but I had a blast at the Rod Serling conference. Really good insights re: the man and his work, the majority of these provided by my friend Marc Scott Zicree, who (literally) wrote the book on The Twilight Zone. Now I've seen nearly every Zone episode and many Night Gallery episodes, but Marc brought out clips I'd never seen before--some from Serling's early television career, including one starring a young James Dean. Perhaps most interesting to me was a clip of Rod Serling pitching The Twilight Zone to sponsors, laying out what kinds of stories they could expect, whetting their appetites for what the show would become. Lots to learn there. I've pitched my fair share of stories, and I'm not half bad, but man oh man was Serling a master. Marc makes an interesting case for Rod Serling being the man who best shifted the balance of power in television toward writers. That "showrunner" position--the writer/producer at the top of the writing staff--that's a position that Serling largely carved out. So despite how synonymous he is with genre fiction, even TV writers who don't write science fiction and fantasy may owe the man a great debt. And I got to meet Carol Serling. We only talked briefly, but she remembered conversations between Rod and my dad. I also met one of Rod and Carol's daughters, who apparently taught my brother back when he went to nursery school. Small world, no? Twilight Zone fan? Like conferences? Going to be in Ithaca this weekend? Friday and Saturday, Ithaca College will be hosting the 2006 Rod Serling Conference, and if you're a fan of Rod Serling's writing, you might have a lot of fun. The keynote speaker is Marc Scott Zicree, whom you may know as the author of The Twilight Zone Companion, or from his dozens of television credits. He's also penned a trilogy of acclaimed fantasy novels about technology stopping and magic returning to the modern day world: Magic Time, Angelfire, Ghostlands. 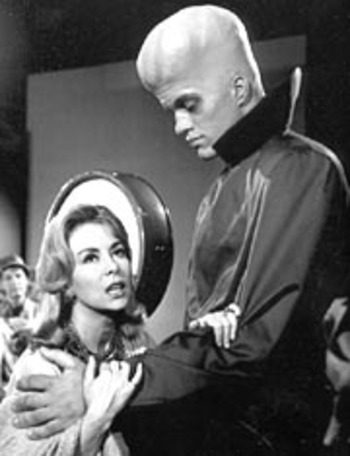 Also, Carol Serling is going to be there. I'd like to meet her, and I wonder if she remembers any conversations between Rod and my father.